How far in advance should I book my stay in Sayulita? Is Sayulita mainly busy in high season (November-April) or are there tourists year round? Is it nice to visit Sayulita in the summer? Do I have to speak Spanish to get around in Sayulita? Is there a time difference between Sayulita and Puerto Vallarta? Is the water safe to drink? How about ice in cocktails? How do I wash vegetables if I can't use tap water? How many people live in Sayulita? Are the local people of Sayulita happy with all the tourists? Are there hotels in Sayulita? Should I bring my surfboard? What can I bring down to help people and children in Sayulita? Is there a bus from Puerto Vallarta to Sayulita? How long is the drive from Puerto Vallarta to Sayulita? What does it cost to take the bus from Puerto Vallarta to Sayulita? Where is the bus stop in Sayulita? What time does the last bus leave from Sayulita to Puerto Vallarta? How much does a taxi generally cost from the airport to Sayulita? Where can I find a taxi in Sayulita? Do taxis accept credit cards in Sayulita? Can I rent a car in Sayulita? Is there a gas station in Sayulita? Are there any grocery stores in Sayulita? Is there a church in Sayulita? Is there a library in Sayulita? Are there AA meetings in Sayulita? Are there any good maps of Sayulita? Is there any nightlife in Sayulita? Is there cell phone reception in Sayulita? Is there Internet / WiFi available in Sayulita? How do I call the US or Canada from Sayulita? Are the ATMs safe in Sayulita? Is there a bank in Sayulita? Can I use US or Canadian dollars in Sayulita? Is it a good idea to visit Sayulita with children? Can you find kid friendly food in the local stores in Sayulita? Do the restaurants in Sayulita offer kid friendly food? Is it easy to get around with a stroller in Sayulita? Are there any childcare services in Sayulita? Can I travel with my dog to Sayulita? Are there other things to do in Sayulita besides surfing? Is there a lot of wildlife in and around Sayulita? Is it safe to walk in the jungle? Can I find a lot of birds in Sayulita? Are there any other beaches in walking distance? Is there good medical care in Sayulita? Are there emergency services in Sayulita? I forgot my prescription medication. Is there a pharmacy in Sayulita? Can I buy things like aspirin, sunscreen and contact lens solution in Sayulita? Is Sayulita mainly busy in high season (November-May) or are there tourists year round? In high season, you will definitely find more tourists in Sayulita than in low season (summer/fall). yet we have seen significantly more tourists in summertime over the past years, and the difference between low and high season is lessening as the years go by. Summers and winters in Sayulita are very different. Some may find the summer in Sayulita too hot and humid while others enjoy the tranquility, beautiful green nature and well-deserved siestas. The peak of the tourist season (meaning crowds, noise and celebrations) is found during Christmas, New Year's, and Semana Santa, the week leading up to and after Easter. More and more people are visiting Sayulita in summer. The seasonal tropical rains ensure the jungle surrounding Sayulita is in full bloom. The tropical rains usually occur during the nighttime, and can provide beautiful lightning shows and occasional thunder. Most of the time, the downpours don’t last longer than an hour or so, followed by the sun coming out during the day. When traveling in the summer, it is a good idea to bring or purchase mosquito repellent, available in all the farmacias (pharmacies). The air is humid during this period, which raises the apparent air temperature. Most of the hotels and villas have a fan or air conditioning to make the heat bearable. Finding a shady spot with an ocean breeze makes for a wonderful respite. For the traveler who loves weather and nature, this period is an ideal time to travel to Sayulita. Rental rates can be considerably lower in the summer as well, which makes Sayulita an attractive choice for budget travelers. Do I have to speak Spanish to get around Sayulita? It is always best to try to speak a little Spanish when you are in Mexico, even if it is simply to say por favor, gracias and hola. However, there are quite a few restaurants in town with bilingual staff, and you will be able to get by. The locals in Sayulita are amazingly adept at understanding “Spanglish” and hand gestures, and are very friendly and encouraging when you try out new words. If you're interested in brushing up on your Spanish while staying in Sayulita, be sure to check out some of our favorite Spanish Studies and Teachers. When you arrive in Puerto Vallarta, you will be on Central Time. Sayulita is now on the SAME time zone as PV. Please note that your cell phone may be showing the time as one hour later than it actually is. It is best to check the local time when you arrive and set your phones and computers accordingly. Although it is still not recommended to drink tap water, many rental homes have water purification systems, or provide bottled water for their guests. The restaurants and bars in Sayulita use purified water for drinking, washing produce, and the ice is made from purified water as well, so no need to be nervous about ice in your margarita. How do I wash vegetables if I can’t use tap water? There is a solution called Microdyn, found in nearly every tienda (grocery store) in Sayulita. Place your vegetables and fruits in a large container filled with tap water, and the number of drops as per the label. Soak for the required number of minutes, and your vegetables and fruits are ready to eat or cook. You can also add Microdyn drops to water to make it safe to drink, just follow the label instructions. The population of full-time residents in Sayulita is approximately 5,000. The population fluctuates with the tourist season, and part-time winter residents. You will find the most people during the winter holidays and Semana Santa, the week leading up to Easter, where the population can be significantly higher. Sayulita depends in part on the tourist-driven economy, and many local people benefit greatly from tourist dollars. Sayulita has grown over the years, and many local people have been able to open or expand their businesses due to the tourist dollar. Sayulita locals are very friendly with tourists. That being said however, it is always best to remember that you are a visitor in a foreign country. Try to speak just a little Spanish, even if it is just “por favor” and “gracias.” The local people in Sayulita are very friendly, helpful, and are amazingly adept at understanding “Spanglish” and hand gestures. As with anywhere you travel, kindness and courtesy and trying to speak the language go a long way with opening up communication. 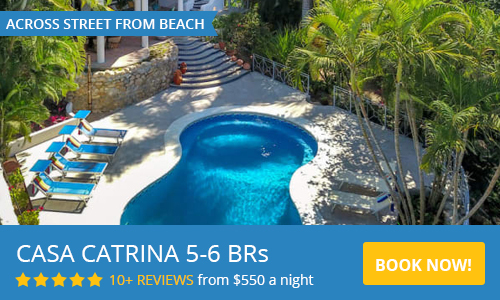 Sayulita has several boutique hotels, in a wide variety of price ranges. You can also find hostels and B&Bs. It is not necessary to bring your board. Sayulita has many surf shops with board rentals of all types. It is convenient and easy to pick up a board when you want to go surf, and to drop it off again when you are finished. No need to haul your board around. There are many goodwill foundations in Sayulita. Contact them before you bring anything over, so you can be sure that you bring something useful and necessary. School supplies are usually welcomed. During the planning stages of your stay in Sayulita, be sure to contact Pro Sayulita, a local organization that provides many goodwill services to the community. You can easily take a bus to Sayulita from the airport or any other bus stop in Puerto Vallarta. If you take the bus at the airport, exit the airport and head left around the building. Cross over the highway using the pedestrian bridge. As you leave the pedestrian bridge, there is a bus stop with a bench. The bus line serving Sayulita is COMPOSTELA and their buses are usually white and green. Look for the name "Sayulita" written on the windshield of the bus. Note: Not all COMPOSTELA buses go to Sayulita. Please note this is a city commuter type bus and there are no luggage racks or places to stow your luggage, so the bus option is best for those traveling light, with a small backpack that can be placed on your lap when seated. Please do not place luggage in the seats. More transportation info can be found here. The distance between PV and Sayulita is 24 miles / 40 km. Driving from Puerto Vallarta to Sayulita by car will take you approximately 45 minutes to an hour depending on traffic.. If you take the bus it is an hour or more due to stops. Fares from Puerto Vallarta to Sayulita are $42 pesos. The bus driver has change, although it is best to try to use the smallest denomination possible. The bus stop is located next to the Salud Clinic, on the main road into Sayulita, (Av Revolucion). There are seats and shade available while you wait for the bus. Fares are: P.V. $42 pesos, Bucerias $20, MEGA $20. The bus stops at all the major shopping plazas in P.V. and terminates at “Gold’s Gym” just past Plaza Genovesa (has Indian style cupola) which is before the road splits for the city bypass & tunnel. Here you can transfer to a city bus to head further downtown. Buses within Puerto Vallarta have a set fare of $8 pesos. Around 10:00 PM. The las bus to leave from Puerto Vallarta to Sayulita 9:00 PM. If you want an airport taxi you have to buy a ticket at the booth. Fares are by Zones. A taxi from Puerto Vallarta airport to Sayulita costs about $1000 pesos; tell them where you are going, and get a receipt. You will keep one copy, and your driver will give one to the clerk as you exit the airport. This is your assurance against being overcharged. Additionally, there are taxis across the street which can be hired by crossing the the pedestrian bridge over the highway. You’ll see the bridge when you come out of the airport at your left. If you hire a taxi off airport property, you may get a better price than an airport taxi +/- $700 pesos. If you prefer to arrange your transportation ahead of time, you may find reputable companies here. Taxis are easy to find in Sayulita. There are usually three or four in the plaza, and then a few more across the bridge as you leave town on the corner where AV Revolucion meets Calle Manuel Rodriguez Sanchez. There is usually a taxi out by the bus stop as well. Do taxis accept credit cards? Taxis in and around Sayulita (and most businesses) do not accept credit cards. Make sure you have pesos when traveling by bus or cab. Yes, you can rent a car in Sayulita, at National Car Rental, or in Bucerias at Gecko Rent-a-Car. Yes, there is a Pemex station where the Punta de Mita highway meets highway 200, about 2km from Sayulita. Here you will also find the convenience store, OXXO and even a Subway sandwich shop and a 24 hour urgent care medical clinic. This Pemex station also accepts debit/credit cards for payment. Sayulita has small markets, called tiendas, where you can find most basic items. There is an abundance of fruit/vegetable stands, and although you may not be able to find everything you need all at one tienda, it is part of Sayulita’s charm to get a bit of this and a bit of that on your shopping trip. More stores in town are catering to visitors' tastes, and you may now find a selection of gourmet and gluten-free items. There is a Catholic church right on the main plaza in Sayulita, and a non-denominational church on Calle Miramar, across from the bookstore. There is also a Kingdom Hall for Jehovah Witnesses. There is no library in Sayulita, however there is a bookstore with new and used books. Some businesses have lending libraries of the “take a book, leave a book” kind. Sometimes vacation rentals have books available to read during your stay as well. Sayulita has Alcoholics Anonymous (AA) in English: Call 322-136-6740 or email heatherinsayulita@hotmail.com for more info: AA Meetings are held at Calle Primavera #11 just off Calle Ninos Heroes, 5:30 PM Tues/Thurs and Sat nights. Find street maps, vacation rental maps, business maps and more here. While you're in Sayulita, be sure to check any of these businesses who carry our Sayulita Map. Our map features many local restaurants, adventure experiences, bars and nightlife, fitness and yoga classes, and more! Current businesses who carry the Sayulita Map are: Don Pedros, Mi Chaparrita, Town Around, Chocobanana, Calypso, Stand Up Paddle, Pajaro de Fuego, Las Hamacas, and El Espresso. Nightlife can begin with sunsets on the beach, dinner and cocktails, and can continue with dancing into the night to live music. Many people like to sit in the plaza and watch the local performers, from fire dancers to Mariachis...There is plenty of nightlife in Sayulita. There is cell phone reception in Sayulita. You may want to check with your carrier to see if your phone will work in Mexico, and to see if you will incur any charges by using your phone here. If you are going to be here for a long stay, you can buy inexpensive, simple cell phones with texting ability at the local Telcel office, and Oxxo. Check with your rental to see if they have internet / WIFI; many do. There are several spots in Sayulita that have WIFI access when you visit their establishment, such as coffee shops and cafes. Don Pedro’s, El Espresso and ChocoBanana just to name a few. To call the United States from Mexico, you must first dial 001 followed by the 10 digit phone number. To call Canada, you must first dial 001 followed by the 10 digit phone number. Due to a recent increase in ATM fraud, it is cautioned to avoid free-standing ATMs in Sayulita, and to use the ATMs inside the Intercam bank on Calle Revolucion as you come into town, across from the Police station. There are also banks located in the Mega shopping complex as well as in Puerto Vallarta and Bucerias. If you do choose to use a free-standing ATM, as with any ATM, look for one inside a building, or in a well-lit area. If the machine looks as if has been tampered with, do not use it. Some travelers have found it’s a good idea to use an account that does not have full access to your money, such as an additional checking account just for travel. You can transfer just the amount you will need to get out of the ATM and leave very little in the account at all other times. You can also use the Cambio Exchange windows in Sayulita to exchange US or Canadian dollars or Euros for pesos when you arrive. Yes, Sayulita now has one bank. Intercam Bank is located on the main road as you enter town on the right, across from the Police station. The hours are Mon - Fri 9:00 AM - 4:00 PM. There is an ATM located there as well. The next closest bank is in Bucerias, 12 miles from Sayulita. Those who bank with Bank of America with an ATM card, the Banco Santander located in Bucerias is considered an international partnered bank. This enables you to avoid the Non-Bank of American ATM $5 usage fee for each withdrawl. Please speak with your account representative about traveling internationally before your trip. Other banks available in Bucerias and Puerto Vallarta are; Scotia Bank, Banbajio, HSBC, Banamex, and CIBank, to name a few. There are money exchange windows in Sayulita, called Casas de Cambio. The exchange rates are displayed daily. You give them the amount of foreign funds you wish to exchange, and they will tell you how much in pesos it will be. At this time, only US and Canadian dollars and Euros are exchanged. If you would like to exchange other foreign currency, it must be done at a bank or at the airport. The rate is usually very good, only a couple of points below the bank rate, and is much better than you would get by using dollars at a restaurant or store, as those places that do accept US dollars do not have a favorable exchange rate. Generally, you will want to use pesos in most establishments in Sayulita. A few, however, will accept US dollars, but the exchange rate varies, and is not in your favor. You will most likely get a better rate from your bank or the money exchange. Your best bet is to use pesos. Sayulita is a quiet town with friendly faces, eager to meet and greet visitors whose patronage is essential to the local economy. It’s safe for people who travel alone or with kids. That being said, do not travel with valuable or exclusive items! There are thefts in Sayulita, just as elsewhere in the world. Always check whether your house or room is properly locked. If you do bring valuable things to Sayulita, it is advisable to use a safe if your rental provides one. Rare instances of violent crime have occured in Sayulita, so be aware of your surroundings and practice safety awareness. Avoid walking alone in poorly-lit areas at night. Sayulita has a great energy for kids. Mexico in general, and Sayulita in particular, are very family oriented. It is a daily treat to find families hanging out in the plaza, Sayulita’s outdoor “living room”. Restaurants welcome children and there is a lot to do and see. The waves in Sayulita are smaller than in Bucerias or San Pancho. The beach is a great place for families, young people and surfers. Kids can play safely at the beach. You also can spend a cool morning hiking in the jungle with your kids. In the village you can find sand castle making equipment, toys and kid-friendly treats, such as popsicles, ice cream and ChocoBananas. Sayuparke, Sayulita's first community park, is now open and is located in a fenced off area at the deportivo (sports field). Can you find kid-friendly food in the stores in Sayulita? You can find all the supplies needed for kids in the grocery stores and pharmacies. They all sell well-known brands. You can find things like peanut butter and jelly, spaghetti and sauce, juice etc. Do the restaurants in Sayulita offer kid-friendly food? Most restaurants also offer “Western” food for kids, such as pizza, burgers, and fries. In addition, there are smoothies, fresh squeezed juices, sushi and tacos. You can find a list of Sayulita restaurants here. If you have access to a jogging-stroller it’s worth bringing. The roads are built with bumpy cobblestones. There are also possibilities to rent a good stroller in Sayulita if you don’t want to take one with you. Yes, there are many childcare options in Sayulita. If you need a babysitter for the night so you can go out for a romantic dinner, or if you want to have your child attend fun day camps, turtle releases, art classes and more. Sayulita also has a community park for children, located in a fenced off section of the baseball field that is open daily. Can I travel with my dog or cat to Sayulita? Your dog or cat is welcome in Mexico, those are the only animals considered mascotas (pets) at this time. You must provide proper documentation from your veterinarian, stating that your pet is in good health and has had the proper immunizations. You can find requirements here. Your pet and papers will be inspected at the airport or border. To return to the US with your dog, read further information here. Besides the ideal watersports holiday, Sayulita has something for everyone. On the beach there are several places that offer massage, chairs and umbrellas for lounging, and delightful food and beverage service on the beach. In the village, yoga and fitness classes are plentiful, and offer various styles. To indulge further, you can even get world-class spa treatments. If you’re more a fan of an active holiday, the jungle around Sayulita offers you beautiful hiking trails, mountain biking, zip lining, horseback riding and a great variety of flora and fauna to observe. Over the years, Sayulita has become a haven for Yoga and Fitness enthusiasts all over the world! Certified personal trainers and yoga instructors are at your disposal in Sayulita. If shopping is your passion, Sayulita offers a wide range of unique shops, where you can find authentic souvenirs, clothing, shoes, interior decoration and more. For the art lovers there are a few art galleries with beautiful art. Mammals: Encounters with animals will be rare, but foxes, tejones/coati, raccoons, armadillos, opossums, skunks and squirrels may be seen. Small vertebrates, reptiles and insects: Land crabs, spiders, geckos, iguanas and other assorted lizards are all around. Usually only geckos are present indoors (they should be welcomed as they eat flying insects) but depending upon where you live (or are staying) snakes and scorpions can be more prevalent. The jungle and gardens will have land crabs - they are harmless and non-edible (hence their numbers) and crawl under everything. In the winter months the Humpback whales use the protective waters of Bahia de Banderas to raise their calves. It is amazing to be up close to the largest mammal on the planet. You can hire a boat in Sayulita, Punta de Mita, or in Vallarta for this exciting excursion. In the Bahia de Banderas all the boats work together to make sure that you see a whale on your trip. Read more abut wildlife here. Pacific Green and Olive Ridley turtles come ashore along this coastline (in Sayulita only the Olive Ridley) to lay their eggs June through October and hatchlings emerge September through December. A group of volunteer residents patrolled Sayulita’s north beach in 2008 and brought over 100,000 eggs from 120+ nests to a safe and guarded area and held controlled releases through the hatching season. The obstacles are so numerous for baby turtles that only about 1 in 1,000 survive to adulthood. Turtles may be observed in the sea while snorkeling, kayaking, and surfing. It is a beautiful sight to see the newly hatched turtles making their way to the sea, surrounded by volunteers who help them make it to the water. Not only is it safe to walk in the jungle, but it is highly recommended! Once you leave the village, you are surrounded by trees, vines, flowers, birds, butterflies and more! The roads are not heavily traveled and it is a nice, peaceful place to walk. More than 300 species are to be found along the coast and in the mountains around Sayulita – 113 species were identified by 2 ornithologists during November. Migration accounts for the great variety during the winter months compared to summer. Some of the largest birds you will see are high overhead, like magnificent Frigatebirds, and others will skim the water, such as Brown Pelicans, while vultures and crows can been seen over the trees. The most common birds seen are gulls and the purple black Grackle with its sharply pointed beak, skewed tail and its amazingly wide vocal range including the ability to mimic - especially cell phone tones! To view birds open your eyes and look around and up into the skies above Sayulita. Gulls and sea-shore birds can obviously be found along the beach but fresh or sweet water birds are common at the mouth of the town river and nearby streams. Around town, bushes and trees host a wide variety of birds. Pairs or small flocks of raucous Orange Fronted Parakeets (which look more green with a yellowish chest) fly from tree to tree, while another noisy local can be seen just before sunset as squadrons of Yellow Winged Cacique flock to a particular tree in the garden of a house at the N.E. corner of the baseball field (opposite the beer depository). Hummingbirds, woodpeckers, flycatchers, orioles, doves, hawks, thrushes and sparrows are common sights. A walk along jungle paths will offer more and different habitats but viewing is more difficult, however by no means impossible. With patience and vigilance colorful Russet Crowned Motmots and Black Throated Magpie Jays can be seen and the turkey-sized West Mexican Chachalaca are not uncommon; all three are endemic to the Sayulita region. In the jungle you may see Lilac Crowned Parrots and even the Military Macaw can be found in the deepest undisturbed jungle. Yes, there are several beaches around Sayulita that are within walking distance, and for an added bonus, you get to walk through the jungle to get there. You can find doctors, dentists, holistic practitioners and more. There are a variety of medical care centers in Sayulita. Sayulita has police, fire and ambulance services. There is also a new 24 hour medical clinic next to the Pemex gas station that has an English speaking person on staff at all times, and they accept some American insurance plans. The nearest hospital is located in San Francisco (called San Pancho by the locals) this is a basic services hospital. For trauma, or other serious issues, the nearest full service hospitals are in Puerto Vallarta, about an hour's drive from Sayulita. Find emergency services numbers and more here. There are farmacias (pharmacies) in Sayulita. If you have your prescription, you can get it filled there. Without a prescription, there are doctors available who can fill your prescription with a consulting fee. In many cases, your prescription will cost a lot less than in the US or Canada. Some medications may be available over the counter as well. The farmacias are also a great resource if you are sick. The doctors on staff are great and offer exams and can provide prescriptions if you fall ill while on vacation. Yes! There are several farmacias (pharmacies) in Sayulita, where you can find all manner of personal care items, first aid supplies and medicine.